Powers/Abilities: Hoffman could shoot energy blasts from his hands which could presumably start large explosions. He was also quite charismatic. History: BTS- Hoffman and Marshal met each other young in life, and immediately started a healthy rivalry, which just continued to escalate. At some point, they started up the militant terrorist group, The Brotherhood. After Marshal left due to Hoffman getting a little power-hungry, he took over as X. (The Brotherhood#1)- In Moscow, Russia, Hoffman was there to congratulate the young mutant Oswald, as he blew up a local dance club. Later, in Brooklyn, NY, he was watching the latent mutant Mike Asher, and planned to send Fagin in to recruit him. When Fagin and Asher got into trouble with an anti-mutant mob, he, along with Oswald, dispelled the crowd. 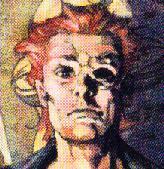 (The Brotherhood#2)- Hoffman, Orwell and Fagin discussed Asher's future in the group, as they watched over his house. (The Brotherhood#3)- After the Colombian government cracked down on the Brotherhood's Colombian headquarters, Hoffman and Orwell made an example out of the traitor who tipped them off. Later, he showed up at Mike Asher's school when all kinds of crap was going down. Talking Asher into joining the Brotherhood, they left. (The Brotherhood#4)- Hoffman and Orwell were in London, and observed the death of Clive. Later that same day, he was back in America, where he told Mike Asher and Fagin that they were going to join the London Sect. (The Brotherhood#6)- Hoffman lamented the fall of the London Cell of the Brotherhood and the death of it's leader, Bryson Bale, before deciding... It's time! 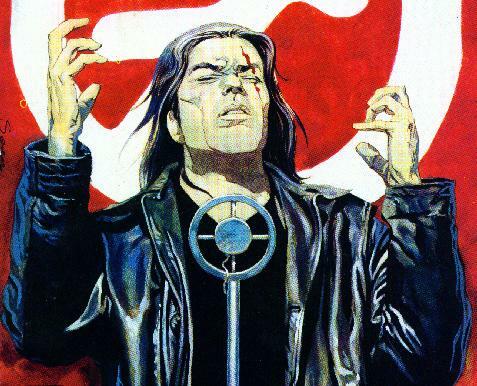 (The Brotherhood#7)- Holding a rally in Philadelphia, PA, Hoffman turned the mutant masses against the police, before heading to the Star Spangled Bar. Inside, he got nice and trashed and tried to get with a barfly. Orwell showed up and the bartender recognized them, pulling a gun on them. Hoffman zapped him, before blowing up the bar. Back at home, he had some more liquid courage and awaited Marshal's strike. (The Brotherhood#8)- After talking about the failed origins of the Brotherhood with Orwell, he gave the surviving members of the London Cell (Fagin, Asher and Malon) orders to take care of another traitor to the cause. After they "completed" their mission, he gave them their next order... To assassinate the figurehead of X-Force, Doop! (The Brotherhood#9)- While things got ugly for the other Brotherhood members at the X-Force parade, Hoffman was able to trap Marshal with help from Ms. Fingers, another Brotherhood member. As Asher dropped from the sky, Hoffman scoffed that the last Judas was gone, but Marshal said he was a fool if he thought that, as Orwell cracked a brick over Ms. Fingers' head. Marshal told Hoffman his plan to become X, the leader of the Brotherhood, but Hoffman fired a blast at him which inadvertantly hit Orwell. While Hoffman and Marshal came to blows, they didn't notice a stream of Mike Asher's blood streaming to them until it was too late. While looking over their remains, U-Go Girl wondered aloud if this was "The end of a revolution?" His name is up in the air, but the barfly in issue#7 called him Marvin, and I'm guessing Hoffman is his last name. Hoffman and Orwell must have some major frequent flyer miles, or an unnamed (YAY! ANOTHER ONE!) member of the Brotherhood who teleported them everywhere, because these guys were all over the place. Orwell PROBABLY could've survived his injury at the end of The Brotherhood#9, but let's go with didn't. Hoffman looked pretty charred and unliving though.